“The opioid epidemic ravaging states and cities across the country has sent a record number of children into foster and state care systems, taxing limited government resources and testing a system that is already at or near capacity. The children entering state care are younger, and they tend to stay in the system longer, than ever before. 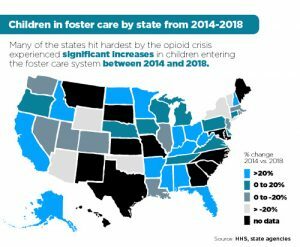 Among states hardest hit by the epidemic, the populations of children in foster or state care has risen by 15 percent to 30 percent in just the last four years.